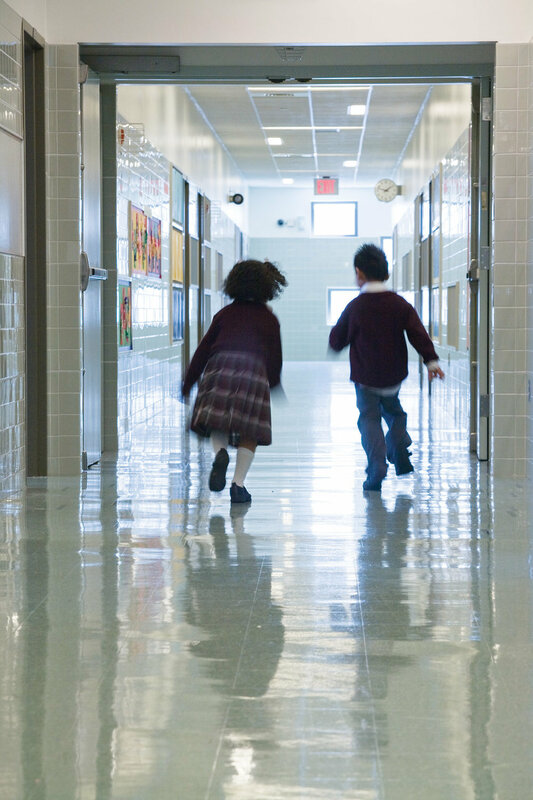 PS 307 is a new 650-student primary school that is located in the Elmhurst section of Queens. Designed to fit within a dense urban site, the building provides a range of classrooms, educational facilities, and outdoor play areas. The 97,000-square-foot building is divided into two parts that define the edges of the site. 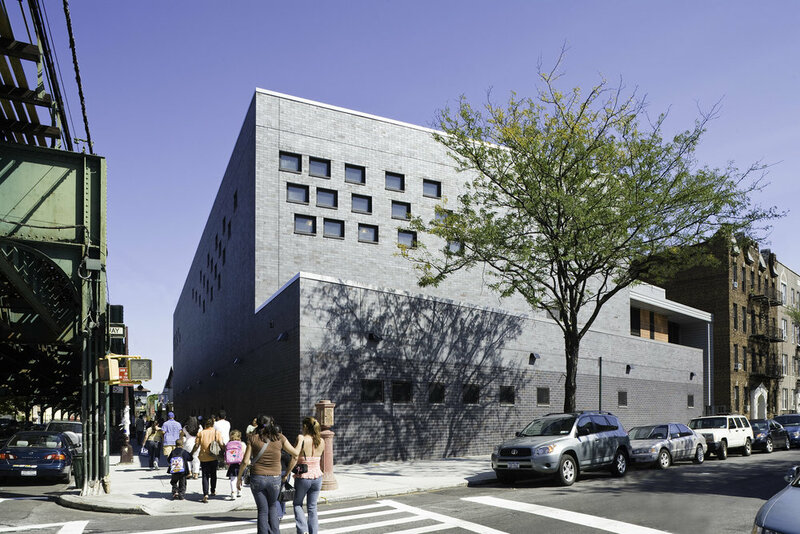 These take the form of a long block along Roosevelt Avenue which contains the larger functions, like the cafeteria, and a bar-like wing along the quieter, 100th Street edge of the site that contains the classrooms and instruction rooms. The entry and major circulation spaces act as a hinge between these two elements. Set back from 100th Street, the main entry creates an outdoor arrival plaza where several streets converge. This outdoor courtyard provides a space for students and their parents to congregate before and after school. A secondary entry is provided from 99th Street at the site’s opposite end. 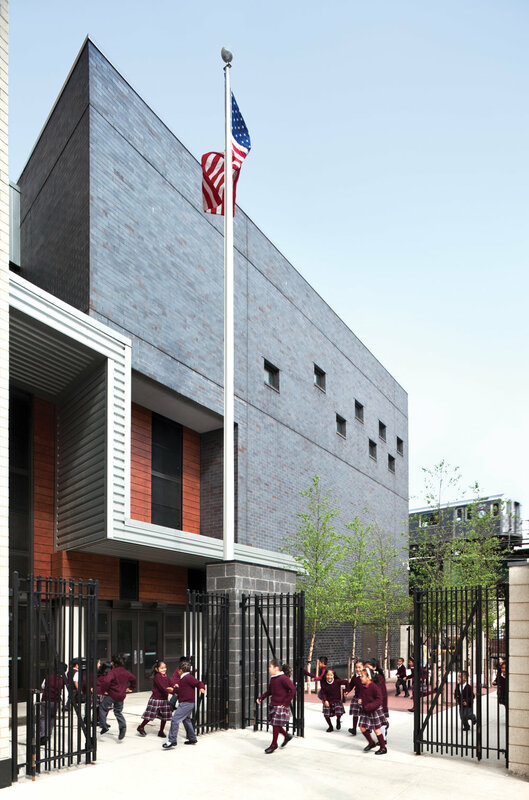 These two entries anchor a double-height, through-block circulation system which connects the major public spaces of the school, including facilities that the larger community can use. These include the gymnasium, the auditorium, and the 300-seat cafeteria. The remaining portion of site, south of 100th Street, is reserved for play areas which are positioned in middle of the block in order to maximize light and safety. The rear portion of the playground is located next to the kindergarten classrooms and provides direct access to them. The exterior cladding consists of brick, with different colors used to distinguish the classrooms from the administrative areas. Other materials include clear insulated glass, metal panels, translucent panels, and perforated metal panels which may be utilized in combination at the entry areas.